I guess it's all in your attitude and whether you can accept change as you grow older or just hide behind "back in my day" statements. Personally I love it although I was never formally trained in any system, like you say it's not really that hard and can be picked up by anyone with a logical brain in a few weeks. Whilst on the subject of grey hairs it's sad to say that hardly a month goes by without me hearing of the passing of another of the great Pipers, some of these guys were truly legends in their own time, often for their drinking abilities as much as their piping abilities, but in an age when those two abilities were synonymous. I was wondering whether you'd ever thought of starting a Pipers Hall of Fame on Piping Designers.com to remember these guys. It could consist of a nomination and a seconding process and go on to include our fond recollections and moderated stories associated with these great characters. When we met in Calgary last summer you were out here scouting for a Project for Ausenco?? did that ever work out or are you back in Ireland now? I finally got work at TransCanada Pipelines, not my kind of work but it couldn't have come at a better time with the looming recession in Calgary.. 5 years work at least & $42 billion dollars worth of work ! Who cares what a barrel is worth, when it still costs the same to move it . I know where you are coming from with your hiding behind "back in my day" statements. But, as you, I and countless others know and realise, "Back in my day" was not today or yesterday, and very quickly, those who persist with that attitude will be left behind, and find it difficult to stay gainfully employed. That's true in and industry, and is not limited to those pipers with grey hair! Software evolves, technology evolves, the industry evolves - and we better make sure we evolve with it, or we go the way of the Dodo. I like the "Pipers Hall of Fame" idea, and I can think of some candidates already ... it would be a nice way to acknowledge those pipers who have helped make the industry what it is today ... and the "war stories" that often go with them are legendary! I very much agree with your article. Many in our profession have spent the Drafting machine to the computer. For many engineers, by request, is run projects PDS, PDMS, AutoCAD, CADWorx, MicroStation, Catia .... with Office, Databases ... etc. Not being most compatible software design forces us to an almost continuous training. 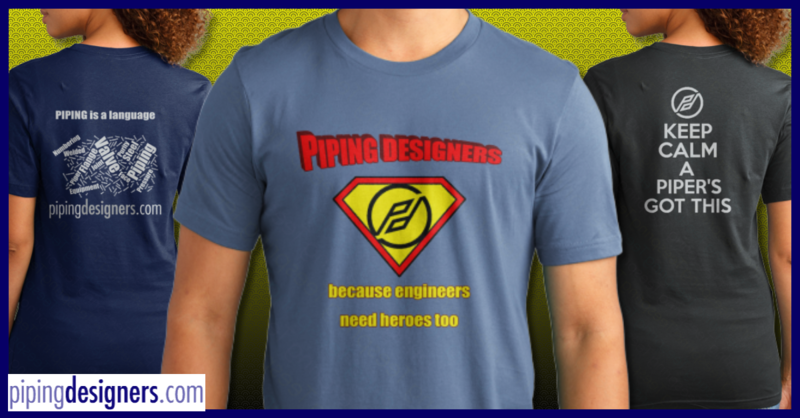 Young people have more skill in its use, but we are losing the specific knowledge of piping. The real experts will retire. Professional becoming more scarce and it is true that, on the other hand, new arrivals are capable of generating a fly in 3D, with textures and shadows but have drawn a fly, not a valve. Neither know why they have to put certain items, or many other concepts as we know, it takes many years to achieve. I think it's a problem of almost all Engineerings, regardless of their country. I've primarily used two different software suites. Catia and Autodesk. Between those two, I can transition to almost anything. Solidworks for mechanical is just CATIA sketcher, broken out on its own. Microstation is similar to CATIA also. Autodesk keeps it's command structure pretty stable from flat 2D to most of its 3D applications (Plant 3D and MEP). The HARDEST thing to do is to train someone to "think in 3D". I've never had a problem with that, even when doing 2D work. But, try training someone who's whole background has been as a 2D cad jockey. Sure they pick up on the software quickly, but they don't get the ins and outs of a 3D way of thinking. As I said in my post on LinkedIn, I'm ready to get out of the business and go sling hamburgers. There's no jobs out there for someone who doesn't fit the pigeonhole of whatever it is the employer wants, the hiring powers that be don't think outside the box and realize that someone with 15+ years' experience can do just about any job set before them. Us oldtimers are more than willing to learn, heck, a GOOD piper never stops learning. We build our reference books, we know where to find information, we go get the information.